Parachute Jumping comes in many forms. Most often it’s done as a tandem skydive. But, by definition, if you jumped out of or off of anything with a parachute you would be parachute jumping. This could be a BASE jump or skydive from an airplane. Below is a list of various types of parachute jumps. During a tandem skydive, an experienced skydiving instructor wears a specially designed parachute. The passenger, usually a novice skydiver, wheres a tandem parachute harness. Shortly before the jump, the instructor connects the harness of the student to their parachute. Both jumpers leave the plane together. During free fall the instructor releases a drogue parachute to control the rate of decent. As a preplanned altitude, one of the jumpers deploys the main parachute. The pair flies the parachute and guides it to the ground. A B.A.S.E. jump is any jump from a fixed object (not an aircraft) with the intention of flying and landing a parachute. BASE is an acronym that indicates the four types of surfaces that can be jumped from: buildings, antenna, span (bridges), earth. It’s generally considered a good idea to be an experienced parachute pilot before making a BASE jump. Statistically, BASE jumping is 8 times more dangerous than skydiving. If you want to start parachute jumping and learn quickly. The Accelerated Free Fall or AFF training program is the best method to learn. After an initial 4-6 hour course, the student is able to jump from a plane, deploy a parachute, and land it safely. The first jump usually costs around $300. The AFF system is taught at many USPA drop zones. When you see movies or photos from WWII you often see a long line of soldier jumping out of the plane connected to a static line. In this form of parachute jumping, a cable is connected to the plane and to the deployment system of the parachute. 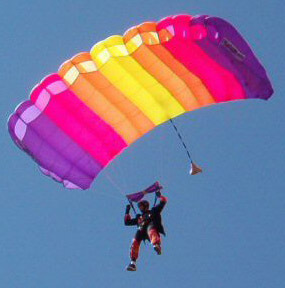 As the jumper leaves the plane, the parachute is automatically deployed. The advantage of this training method is that the jumper only needs to focus on learning to fly the parachute. Students often transition to the Accelerated Free Fall program after they have learned to safely fly their parachute. The Instructor Assisted Deployment or IAD system of parachute jumping is similar to the static line method except the instructor deploys the parachute as the student leaves the airplane. The student usually transitions to Accelerated Free Fall or AFF after they have mastered plane exit and canopy skills. Click on the state links to the right to find a drop zone near you. Each of the drop zones listed can assisted you in learning the art of parachute jumping or skydiving as it’s more commonly referred.